﻿ Center Point Plaza Hotel, Bangkok - SAVE ON AGODA! "I selected the Center Point Plaza Hotel due to its convenien..."
Have a question for Center Point Plaza Hotel? "Its clean, and the staff were friendly enough ( since they are not talked in English that much ) ." "There will always a live music every single day ." "Bar on the third floor was busy and a good place for live music and to meet people." Designed for both business and leisure travel, Center Point Plaza Hotel is ideally situated in Khaosan; one of the city's most popular locales. The hotel lies 0.8 km from the city center and provides accessibility to important town facilities. A haven of rest and relaxation, the hotel will offer total renewal just steps away from the city's numerous attractions such as Khao San Road, Star Fashion Bangkok, Rambuttri Road. The facilities and services provided by Center Point Plaza Hotel ensure a pleasant stay for guests. This hotel offers numerous on-site facilities to satisfy even the most discerning guest. The ambiance of Center Point Plaza Hotel is reflected in every guestroom. internet access – wireless, air conditioning, wake-up service, telephone, fan are just some of the facilities that can be found throughout the property. The hotel offers fantastic facilities, including games room, to help you unwind after an action-packed day in the city. Center Point Plaza Hotel is an ideal place of stay for travelers seeking charm, comfort and convenience in Bangkok. Small, noisy but okay price. staff was good, no A/C or shower issues, they worked fine. 4th. floor. no lift, room was clean, right in the middle of the Khaosan Road so plenty of places to eat and drink. If you like the party ambiance you'll like the room. 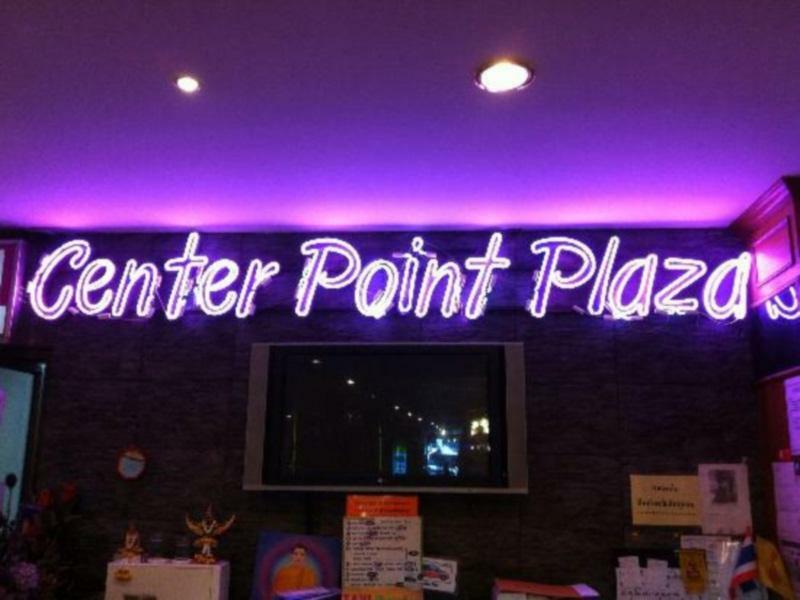 I selected the Center Point Plaza Hotel due to its convenient location in the heart of Khaosan Road where I picked up transportation early the next morning. Any hotel or guesthouse in this area is going to have noise issues until 2am or so, but the 4th floor room I stayed in was not so bad. I could hear music from the live music in the bar on the front of the 3rd floor, but I did not need ear plugs to sleep, and I am a light sleeper. Location is great, although you will need to walk a short distance down a covered shopping alley to get to the lobby and there is no elevator for those with luggage. Other reviewers have complained about staff trying to keep 500 THB deposits for various reasons, but I had no such trouble, spoke respectfully to the staff, and got the entire deposit back when I returned the room key. Room itself was only in so-so condition: TV audio did not work, WiFi was not reliable, and the bathroom door did not shut correctly. Still, for one night at this price, it was adequate. In a scale of 1 to 10 I say it is at 7; our stay was great not only in terms of comfort but location as well. Though Khao San Road is a busy place particularly at night, but this hotel is a great place to stay whenever one wants to visit the Grand Palace and Khao San Road among other tourist attractions in Bangkok. However, I wish that there be more electrical outlets to be provided and more tv channels to choose from. Typical Khaosan Road crashpad. The room is fairly clean, the location is right on Khaosan Road and a bit noisy but that's what your looking for if you are staying on the famous bar street anyways. Bar on the third floor was busy and a good place for live music and to meet people. All in all nothing fancy but definitely serviceable for a night in Bangkok. I was in Bangkok for 10 days and i really enjoyed this hotel. Its clean, and the staff were friendly enough ( since they are not talked in English that much ) . I stayed at 2nd floor and they will clean up our room by the morning time and it was really safe. At 3rd floor, they had their own bar which awesome. There will always a live music every single day . There is no breakfast service or pick up airport but its not really big problem because the location it self is the centre from every public's store. This place is about halfway up the khao San Road, which is really good fun. It's easy enough to find. Room was fairly large with a very small private bathroom (shower toilet sink). The staff were really helpful when I needed to print and scan some documents. There's a live music bar on the level above the guest rooms which was pretty noisy but didn't bother me, and wasn't running much later than when I went to bed. No breakfast. Free aircon and wifi. Located on the Kho San rd so excellent location, great stop if going to the airport. We stayed here as a pit stop before leaving for Bangkok airport the following day, brilliant loaction but need to take into account bar on roof and noise from street until 3am. Bed was broken on one side and shower was so small you could use toilet and shower at same time! However had TV aircon complementary water and helpful staff. You get what you pay for. Roof to bar is cool. Rooms are neet and clean (little old but quite good). Will suggest for bachelors. Not good for family crew who may not like too much noise on night. Hotel is just beside the khao san road night market street. So there is too much noise after 10 pm till 3 am in the morning. Will accept both cash and card in reception. Helpful and friendly staffs, room is tidy and clean, location wise is good as it's located at the heart of Khao San Road. However, try to request for a higher room as there's a bar located at the 3rd floor. In conclusion, everything is OK and worth the money. This place is in te core of the party. There is a bar in the building and the noise goes really really loud from 9pm - 2am in the morning. You feel the music in your head and body if you go to bed before 2am. It's a nightmare. So if you want to sleep during your stay this is not the place for you. Internet in 4th floor doesn't work and in 2nd floor is funky but works. The room is clean enough. The bed is a little uncomfortable and pillows really tick. There is a security box. Water the first day. No fridge but there are plenty grocery stores around. Room 203 is spacious and somewhat quieter than the rooms in 4th floor but still you can hear everything and it's extremely loud. The price and location is good. However, besides the noise which can be expected..the queen size mattress provided is atrocious...it caves in on one side..difficult to slee properly. Watch out for the extremely low toilet door. I am not tall but hit my head several times. 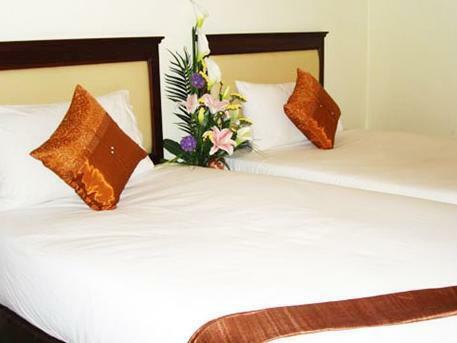 Budget hotel with excellent location in the heart of Khao San Road. Cheap and basic. Pay a couple of pound more and stay somewhere else. Location looks ok but its so loud after 23.00. Rooftop bar is on top of this hotel. Rooms are not clean, they smell and too small. Will never come back here! So far so good, just that lift is unavailable for guests staying at the highest floor.